A Block Away Quilt Shop's online mystery quilt projects will be found here. Select the quilt you wish to create to find all the instructions for that mystery quilt project. If you have never worked on a mystery quilt before, you can read the article, It's a Mystery, to learn what a mystery quilt is, what you need to know, and what to expect. 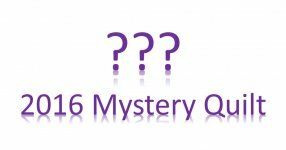 2016 Mystery Quilt Week 1 - This first week's article covers fabric requirements and cutting instructions for this mystery quilt. 2016 Mystery Quilt Week 2 - This article is the first that covers the instructions to complete the first section for the quilt. 2016 Mystery Quilt Week 3 - This article covers the instructions to complete the second section for the quilt. 2016 Mystery Quilt Week 4 - This article covers the instructions for the third section of the quilt. 2016 Mystery Quilt Week 5 - This article finalizes the sections of the quilt with instructions for the fourth and last section for the quilt. 2016 Mystery Quilt Week 6 - This last article provides instructions to assemble the sections into a block and assemble the blocks into the quilt top, thus revealing the quilt.